A small group of Colorado citizens is hoping to overturn a bill passed earlier this year joining the National Popular Vote Interstate Compact (NPV), a workaround to implement a major shift to the Electoral College without amending the Constitution but which detractors argue is unconstitutional. Although 12 states and the District of Columbia have already passed NPV legislation, the effort could create one of the first times a citizenry will vote on the idea, and could make the state a proxy in the ongoing debate over the Electoral College as more Democratic presidential candidates are campaigning on abolishing the constitutionally created institution. Colorado's constitution allows citizens to reject laws passed by the state general assembly with a ballot referendum, a challenge that's been eagerly accepted by Mayor Don Wilson (R.) of Monument, a small suburb just north of Colorado Springs. "Some of these people that don't have an understanding of the Electoral College or don't understand what the National Popular Vote does, it's as simple as, ‘Hey, do you really want Raiders fans deciding your vote?'" Wilson said. The NPV is a series of laws passed in various states that changes how the state would dedicate their electors in presidential elections. Rather than devoting all of the electors in a winner-take-all method to the candidate that won the most votes in the state, the NPV makes a compact that the electors will instead be dedicated to the candidate who wins the most votes nationwide. Central to the NPV is that it does not take effect until enough states have joined so the combined number of electors reaches 270, the number needed to win the presidency. After Colorado governor Jared Polis quietly signed NPV legislation two weeks ago, the tally of electors in the total NPV effort stood at 181. Legislation has also passed both the state house and senate in New Mexico, and if signed by Gov. Michelle Lujan Grisham, five more electors would be added. Wilson's push for a repeal referendum, working alongside Commissioner Rose Pugliese (R.) of Mesa County on the Western Slope, needs to collect more than 125,000 valid signatures by Aug. 1. If approved, the question would appear on the November 2020 ballot. As Wilson's earlier comment indicates, detractors of the NPV argue that highly populated urban areas such as Southern California and the New York City metropolitan area would have the greatest electoral power under the scheme, and that less populated areas in middle America would lose influence. Others have argued since the NVP first came on the scene around 2006 that the agreement violates the "compact" clause of the Constitution, which says that states cannot enter into compacts with each other unless approved by Congress. Colorado state representative Jeni Arndt (D.), a co-sponsor of the bill, hopes the NPV will survive, but was clear she supported the rights of those who want to see a challenge. "I just really feel like this is a great national discussion of how we take our republic into the future, and it's part of our national discussion of what we want our country to look like, which I think is completely engaging," Arndt told the Washington Free Beacon by phone. State senator Mike Foote (D.), who sponsored the bill in the upper chamber, did not directly address questions about the Wilson-Pugliese effort. "The presidency is our only nationwide election and the winner represents our entire country," Foote told the Free Beacon in an email. "The votes of all Americans should be courted and should count equally. The National Popular Vote compact ensures both of those things happen." 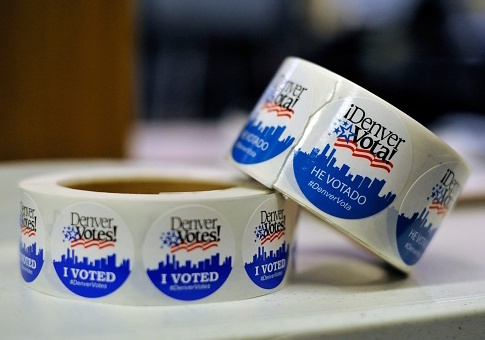 Although the NPV's effort made its first significant move outside of solidly blue states this year by gaining the "purple" state of Colorado, it still has a difficult task ahead. To reach the 270 mark, a state in which Republicans currently hold significant sway will have to be won as well, something critics say is highly unlikely. Both Wilson and Rep. Arndt said they are too focused on immediate tasks to comment on what a campaign in a presidential election year might look like. But Wilson said he's only encouraged by the support he's received of people willing to volunteer to go get signatures, and says his core team of five to six people has raised "about $25,000." Wilson says most of that has been online, "grassroots" fundraising, but acknowledges he will "have to pursue larger donors," and will likely need somewhere between $250,000 to $300,000 to have a chance at submitting enough valid signatures. "In less than a week, we have over 800 volunteers out with their own petitions," Wilson said. "I hope we can set the example for other states that you don't have to deal with this," he added. "There are ways that it can be addressed. Maybe not the same way as us, but there are ways." Colorado's newly elected secretary of state, Democrat Jena Griswold, has been a backer of the NPV and celebrated its passage. As the Free Beacon reported in February, Griswold declined to turn over communications from her office regarding the NPV after an open records request. State law allowed the non-disclosure of the documents but also expressly permits the officeholder to divulge the documents if they so wish. Griswold declined to do so when the Free Beacon asked her to voluntarily turn over the communications requested. This entry was posted in Politics and tagged Colorado, Election. Bookmark the permalink.